Aquariums are legendary for their bright, neon colors. So why waste time with aquarium fish that have dull colors? If you really want to add some wow factor to your living space, then nothing can beat the top 5 most colorful aquarium fish! Bettas come in a huge variety of colors — red, blue, orange, purple, yellow, and even black! They’d probably be higher on the list if not for the fact that each betta fish usually only exhibits one or two colors. Some people like the monochrome look, but at the end of the day it’s hard for an all-blue or all-red betta to compete with the rainbow colors of other fish. The great thing about bettas is that they’re freshwater fish. Saltwater fish tend to be much more colorful and visually interesting than freshwater fish, but betta keeps the freshwater community in the running with their beautiful, flowing fins and shimmering colors. Don’t let the intimidating name fool you. They aren’t named for their proclivity to kill other fish — the name derives from the Dutch word “kilde,” which means “small creek” or “puddle.” They probably should have used the Dutch word for “bright” or “colorful” instead, because this species exhibits a beauty that’s unmatched by most of the aquatic world. They typically have a mottled red-and-blue or orange-and-blue coloration, which provides striking contrast between cool and warm colors. Bettas aren’t the only ones representing freshwater tanks. Discus fish can add bright colors and stunning patterns to any freshwater aquascape. Despite their diverse colors, they are usually united by their iconic mottled pattern — it’s kind of reminiscent of how a human brain looks. Discus fish come in single color varieties, but monochrome discus usually can’t hold a candle to their 2-, 3-, or 4-color counterparts. Tangs don’t exhibit a lot of diversity in their colors, but they more than make up for it with intensity. Blue tangs are so blue that they almost look unnatural. They seem to glow, as if charged with vibrant electrical blue energy. You can put these fish alongside any other creature in the animal kingdom and they will still stick out. These guys prove that you don’t need a lot of different colors — you just need to do a single color incredibly well! If you had an aquarium when you were growing up, then odds are fairly good that your fish could swim through the plastic skeleton of a tiny sunken ship. There’s just something viscerally appealing about including a sunken ship in your aquarium. It’s not that we’re attracted by the sense of loss or tragedy — it’s that they appeal to our childlike sense of adventure. Even though most shipwreck sites have been completely picked clean, there’s always the little idea at the back of our mind that makes us think, “What if the ruins are hiding some sort of priceless treasure?” That idea captivates us, which is why sunken ships have always been such a popular centerpiece for aquascapes. The other big appeal of ruins is that they invoke a sense of history. What was the story of this ship? What made it sink? What — or who — was lost when these ruins sank into the sea? Ships like the Titanic and the Estonia captivateus because of their compelling stories. A shipwreck in your aquascape obviously won’t have much of a history, and it certainly won’t have a sunken treasure chest unless you put one there, but they still do an excellent job of delighting the kid in us. The main thing that you have to watch out for with a sunken ship is that there’s a fine line between a cheap-looking kitsch and a high-quality aquascape. It’s not that there’s anything inherently kitschy about sunken ships, it’s just that a lot of the sunken ships you find are cheap plastic models. If you want to include a shipwreck at the bottom of your aquarium, then your best bet is to seek out a professional company that can design custom, high quality shipwreck ruins. Another strategy is to include ship parts rather than an entire sunken ship. A Ship’s wheel is ideal because it’s so iconic and visually intriguing, but you could also drape rope nets across of rock formations, include portcullis windows, or nestle ship cleats along the bottom of your aquascape. The trick is to come up with something unique. Coral colonies grow in unique patterns and every fish is one-of-a-kind. Ship parts, on the other hand, can be incredibly common. Try to use visually compelling and custom-designed ship parts so that your aquascape is as one-of-a-kind as you are. Whether you go with a complete shipwreck or just a few scattered ship parts, these maritime figurines can add a sense of wonder to your custom aquascape. It’s a perfect option if you’re building a custom aquascape for your children. The mysteries inside the drowned ship will keep your kid’s imagination running for years. Can fish help cleanse your chi? Can goldfish bring you wealth? Feng Shui practitioners answer “yes” to both of these questions, as they feel that the arrangement of your home can have a major impact on your life. I’m not going to get into a debate of whether or not Feng Shui actually works. Today, all we’re going to do is take a look at how to incorporate Feng Shui teachings into your aquarium – either for spiritual or purely aesthetic reasons. Aquariums are a little bit unique in the world of Feng Shui because they include all five elements. Wood is represented by the plants in the aquarium, metal exists in the actual structure of the aquarium, earth is in the soil or sand, fire comes from fish with warm, orangey colors, and water… well, that one should be obvious. These five elements working in harmony give aquarium owners a sort of five-for-one deal that can (according to advocates of Feng Shui) help you attain more wealth. Putting an aquarium in the right spot is a pretty big deal in Feng Shui. I touched on this topic briefly last week when I mentioned that Feng Shui recommends placing an aquarium next to your front door, but practitioners also recommend keeping an aquarium in the southeast area of your home because that area is attuned to wealth and abundance. Practitioners also highly advise against placing an aquarium into your bedroom or kitchen because the water element will “cool down” the fire element in your bedroom. Fire element is important for romance, so I suppose this is the spiritual equivalent of a cold shower. The type of fish that you keep in your aquarium is slightly less relevant, but Feng Shui practitioners do have a few recommendations. They suggest keeping eight gold-colored fish to improve your luck, along with one black fish that can absorb all of your negative chi. Supposedly, you can gauge the energy of your household by keeping an eye on your black fish. A healthy black fish means that you’re in the clear, while a belly-up fish means that you’re in for some trouble. If an aquarium is supposed to bring you wealth, then a mucky aquarium will also muck up your bank account. Keep your aquarium clean and well-maintained in order to keep your fish and your finances happy. Of course, if you get your aquarium through Okeanos Group, then you can rest easy knowing that a team of professionals will take care of every aspect of your aquarium for you. So, Feng Shui: a spiritual guide to better living or just a pretty art style? I’ll let you decide on that one. But whatever the case, following these general guidelines will give you an eastern-inspired aquarium that gets the Feng Shui seal of approval. My great grandmother had Alzheimer’s. It was really hard to watch sometimes because she would get really confused and forget who we were. My family, especially my grandmother (her daughter), was there for her throughout the ordeal. If I had known then what I know now, I definitely would have gotten my great grandmother an aquarium. Research from Purdue University has found that aquariums with brightly colored fish can help treat patients with Alzheimer’s. Who would have thought? Professor Nancy Edwards performed a study on 60 individuals diagnosed with Alzheimer’s. Edwards discovered that the test subjects who were regularly exposed to vibrant fish tanks appeared to be more relaxed and alert. They also ate up to 21 percent more food than they had before, for an average food consumption increase of 17.2 percent. And aquariums didn’t just improve the subjects’ appetites – the subjects were also much less likely to exhibit disruptive behavior such as yelling or wandering. One of the patients, who hadn’t uttered a word in weeks, spoke up for the first time and asked the researchers questions about the fish. Another patient would share stories about his early days running a bait shop. It’s surprising to think that something as simple as a fish tank could combat the effects of Alzheimer’s. With all of these benefits, aquariums almost seem like some sort of miracle drug that improves alertness and overall health. If you have a loved one who’s suffering from Alzheimer’s, then you really should consider investing in an aquarium. Not only will it give your loved one a beautiful aquascape to enjoy, but it will also improve the person’s mental and physical health. Just think of a custom aquascape as a daily dose of medicine that’s actually fun to take. Plants dominate the conversation in the world of freshwater aquariums. It’s a bit ironic considering that most people associate aquariums with fish. The reason why fish are so often overlooked is because the selection and careful arrangement of plants are the most important aspects of a freshwater aquascape. Freshwater fish are usually added afterward to compliment the aquascape, kind of like sticking a pretty, frilly paper umbrella on the top of a tropical drink. Still, that doesn’t mean that you should ignore the frilly umbrella entirely — what good is a pina colada without a little pink umbrella? The most popular species of freshwater fish might be tiny, but they make a huge impact on the overall visual quality of your aquascape. For example, the picture up top shows just how important fish can be in a freshwater aquascape. The plants are beautifully arranged, sure, but the neon tetras (the blue fish) add striking color the scene, which is contrasted against the dull, muted colors of the rasboras (the orange fish) in the background. In fact, I would even go so far as to say that the blue tetras are the focal point of the piece. If the aquascaper had left out the tetras in favor of the rasboras, then it would have completely altered the aquarium’s focus. Is plant arrangement more important than freshwater fish selection? Definitely, but that doesn’t mean that you should ignore fish options when you design your aquascape. Tetras may very well be the single most popular fish for freshwater aquascapes. They’re extremely tiny — about one to two inches in length — but they pack a punch when it comes to color. Depending on the specific type, tetras can add flashes of red, blue, orange, yellow, or silver to your aquascape. They also hold the advantage of being fairly peaceful. Your tetras will float around your tank, but the most part they will add a relaxed, serene quality to the aquascape. Overall, tetras are a great way to add vibrant colors to your aquascape without drawing too much attention away from the plants and rock formations. Guppies are another popular pick because of their colorful, elegant fins. What makes guppies so perfect for freshwater aquascapes is that their tails are an excellent complement to frilly plants. Their delicate fins will flutter in much the same way that aquarium plants drift with the current. Tetras and guppies both do an incredible job of establishing a sense of scale for your aquascape. The smaller your fish are, the more massive the surrounding aquascape will feel. Combine a school of tetras with an underwater tree and suddenly the tree will look gigantic by comparison. For contrast, let’s contrast guppies and tetras with discus fish. There are few freshwater species quite as eye-catching as the discus fish. As soon as you put discus fish in your aquascape, the freshwater plants will immediately have to bow out and give center stage to these dramatic, colorful fish. Discus fish are so versatile because they come in a variety of colors. Orange and yellow discus fish will give your aquascape a warm, energetic feel, while purple and blue discus fish will make your aquascape feel more subdued. You can always mix and match colors to create an exciting display of colors. That strategy is particularly effective if you place them within an aquascape that cleverly utilizes green and red plants. And for the ladies out there, you can always use the beautiful colors of your aquascape as inspiration for your spring wardrobe or manicure colors. Few fish capture the healthy aura of spring quite like the discus fish. As you can see, aquascapes with tetras have a completely different feel and focal point from aquascapes with discus fish. Both are eye-catching and colorful, but tiny size is (ironically) a huge factor in freshwater aquascapes. Don’t get trapped into thinking that bigger is better. Discus fish and other large species of fish are great and all, but a handful of tiny tetras or elegant guppies can add to the beauty of your aquarium without distracting viewers from the subtle plant arrangement. We’ve just finished up our warm colors (red, orange, and yellow) so now we’re moving over to the cooler colors. First up on the list is green, which just so happens to be my favorite color. So, without further ado, let’s dive into the most prolific (and most beautiful) aquascaping color. Green is the symbol of life, fertility and nature — not surprising considering that it’s the color of plant life. We instinctively adore green because the color indicates that we are in an area full of abundant life and sources of food. Much like yellow, which symbolizes new beginnings and daylight, green represents freshness and youth. It’s a cheerful, pleasant color that makes people feel safe and cozy. There’s no debate here — freshwater aquariums are indisputably the better choice for green aquariums. Green fish are few and far between, so you have to utilize plants in your aquarium in order to create a lush, verdant aquascape. The great thing about freshwater plants is that they come in a tremendous variety. Color ranges from deep, rich green to a bright yellow-green. You can get short, grass-like moss or frilly plants that stretch upward to the surface of the water. If you’re a green lover like me, then there is absolutely no better choice than nature style aquariums, which incorporate dozens of different types of plants in a chaotic yet harmonious assortment. Saltwater aquariums just can’t hold a candle to freshwater aquariums when it comes to the color green. There are a few species of saltwater plants, like kelp, but they aren’t very popular in the aquarium hobby. It’s not that kelp is unattractive, it’s simply that saltwater plants are overshadowed by bright coral and tropical fish. As one of the most calming colors, green is an excellent choice for the bedroom or other rooms that promote relaxation, such as your reading room. There’s nothing quite like a verdant aquascape to help you relax after a long day of work. The green, gently swaying plants will melt away your stress and encourage a deep, restful sleep. Green is such a relaxing and well-liked color that it can fit in just about any room. I mean, think about potted plants — can you think of any room where a bit of nature wouldn’t liven things up? That being said, you might want to avoid using green in rooms of your house that are supposed to energize and excite people. If you’re the type of person who loves to host dinner parties and have people over, then green is probably a bad choice for your living room because it will mellow people out instead of making them chatty. Aquariums are kind of an exception to the rule, though. Aquascapes, even relaxing green ones, can act as a centerpiece that will spark conversation and keep people interested. That’s the beauty of a green freshwater aquascape — it fits in pretty much everywhere. This whole week I’ve been focusing on the most popular aquascaping styles. We’re going to end this week by talking about the most exciting aquascaping style of all: your own! Dutch aquariums, nature aquariums, and other prominent aquascaping styles are all popular for a good reason – they’re beautiful. But just because everybody else is building Wabi-Kusa or Dutch style aquariums doesn’t mean that you need to jump on the bandwagon. Your aquarium can be as unique as you are! So today we’re going to take a walk of the trodden path by looking at unique, bizarre, and just plain weird custom aquariums. This stunning home aquarium is fairly close to a nature style aquarium, but the mountain-like protrusion with a twisted bonsai tree give it a truly unique vibe. It’s like the aquascape is 90% aquarium and 10% garden. The comparative simplicity and stark elegance of the actual aquascape was a wise move. If the creator had created a colorful Dutch style aquascape, the bonsai tree would have been visually swallowed by the plethora of vibrant plants. Many aquascapers aim for visually stunning pieces that capture the very essence of beauty, like aquatic versions of Starry Night or the Venus de Milo. But keep in mind that just about anything that can be artwork, even something that most people would call dirty or ugly. This aquarium probably isn’t going to win any beauty contests, but believe it or not the owner intentionally built it this way. What he created is a true nature aquarium. It doesn’t just replicate nature – it is nature. Rather than attempting to maintain a perfectly manicured aquascape, the beauty of this aquarium comes from how the various species interact in a truly organic and chaotic ecosystem. Is it ugly? Perhaps – many people would call it that. But is it unique and interesting? You bet. Ever wonder what it feels like to be one of your fish? This rather unorthodox aquarium solves that mystery. This mini aquarium, an Ecosphere, takes the concept of a self-sustaining ecosystem to a whole new level. These aquascapes are basically tiny little worlds that have everything they need to survive built right in. The shrimp consume algae and other micro organisms. Those micro organisms break down the shrimp waste in a perfectly complete cycle. All they need is a bit of sunlight and the ecosystem can survive for as long as 2 to 3 years. We’ve seen plenty of aquariums with built-in gardens. How about a garden with a built-in aquarium? This clever aquascape rests precariously among the twisted branches and thick moss. So, what can we take from these unorthodox aquariums? It’s simple really: Break the mold! Be a trailblazer! Think outside the box! Invent something new! Aquascaping styles are a great starting point, but don’t get bogged down by what everybody else is doing. Let your imagination run wild and come up with a beautiful custom aquarium that is truly as unique as you are! Peace, calm, tranquility — if these are the things that you seek, then a custom aquarium is the way to go. But there’s only one problem: the constant hum of lights and the persistent bubbling of water pumps can kind of ruin your tranquility. Today we’re going to talk about ways to cut down own noise pollution and build a quieter aquarium. Getting rid of excess gear is definitely one of the easiest ways to silence your aquarium. Some gadgets are necessary for your aquatic life to survive, but other equipment can be removed as long as you help your ecosystem flourish in its absence. For example, freshwater tanks can survive with nothing more than light and food, assuming that you do frequent water changes and monitor the water condition. Freshwater ecosystems can thrive on their own because the plants and animals do a good job of replicating the cycle of life that takes place in nature. Saltwater aquariums, unfortunately, aren’t quite as versatile. You probably won’t be able to skip out on gear. If you can’t get rid of noisy equipment, then you can always muffle the noise by hiding gear behind thick cabinets or behind furniture. That’s one of the reasons why aquariums built into cabinets are so popular. Not only does the lower compartment hide unsightly equipment, wires, and tubes, but the thick wood of the container also muffles the drone of electronics. You get what you pay for. If you select a cheap piece of equipment, then there’s a fairly good chance that the hardware will be noisier than one of its pricey counterparts. I recommend that you specifically look for low-noise equipment that will run in near-silence. Overflow systems are notorious for their noise, so you should follow instructions for building quieter overflow systems. Aquascapers aren’t the only people who have waged a war against noisy equipment. Computer technicians, car manufacturers, and pretty much every other profession that deals with moving parts has thought up ways to cut down on vibration. Get rubber vibration mats or insulating material from specialized stores like car parts stores or computer parts stores. When installed against fans or noisy pumps, the anti-vibration material will absorb the noise and leave you with a whisper-quiet aquarium. You might also want to line the inside of your aquarium cabinet with insulating material like foam or rubber. If you’re on a shoestring budget, you could even attach egg cartons to the walls of the cabinet to break up sound waves. The more you do to cut off noise vibration, the quieter it will be. We’re in the middle of the Age of Information, a time when digital data reigns supreme. While computerized fish do an awful job of replacing the real thing, it might be nice to have the option to watch pixelated fish swim around your computer screen when you can’t get access to a real thing. After all, double-clicking a fish program requires a lot less effort than keeping an aquarium clean and beautiful — and it’s probably a lot less expensive, too. I thought it’d be nice to share with you some digital alternatives for the truly fanatical fish lover. There have been screensavers of fish swimming across the computer screen for as long as I can remember. The ones from a few decades age were grainy and fairly bare-bones, but the screensavers of today are almost like works of art. Some premium screensavers, such as Sim Aquarium 3D, give you a front row seat into the subterranean world. You’ll probably want to resist the temptation of installing this on your work computer, though. Most aquarists would be more tempted to stare at their screensaver all day then actually get some work done. Digital fish tanks are pretty simple. You take a digital device, play looping footage of fish, and frame it so that it looks nice. The advantage is that you can stick it just about anywhere, but it’s a bit kitschy. If somebody comes over to your place and they see one of these things, you can bet your bottom dollar that you’re going to be getting “Why don’t you just get a real fish tank?” thrown at you. They’ve got video games for just about everything, don’t they? This game, Fish Tycoon, turns you into a fish matchmaker. The objective is raise and breed fish to uncover magical breeds. It’s definitely not the prettiest game out there, but it might just appeal to a few oddballs out there who get an unnatural joy out of raising fish. Of all the virtual tanks I’ve seen, this one is definitely my favorite. It’s so simple and elegant that it actually does a decent job of replicating what it’s like to throw food pellets into a pond, but without all the crazy feeding frenzies. Yeah, I know that that’s half the fun, but this pseudo-game is more about relaxing than getting an exciting show. I’d love it if I could use this as the background for my iPad, and I dropped food pellets whenever I clicked on the screen. Wouldn’t it be neat to see the koi swim beneath all of the apps and gobble up the food pellets? Oil Rigs: Future Site of Suburbs or Aquatic Prison? Just recently, we looked at Seaventures Resort, an old oil rig that had been refitted to accommodate scuba enthusiasts. Seaventures is a smart example of efficient recycling. Why spend more to build a floating hotel from scratch when you can just reuse something that’s already there? 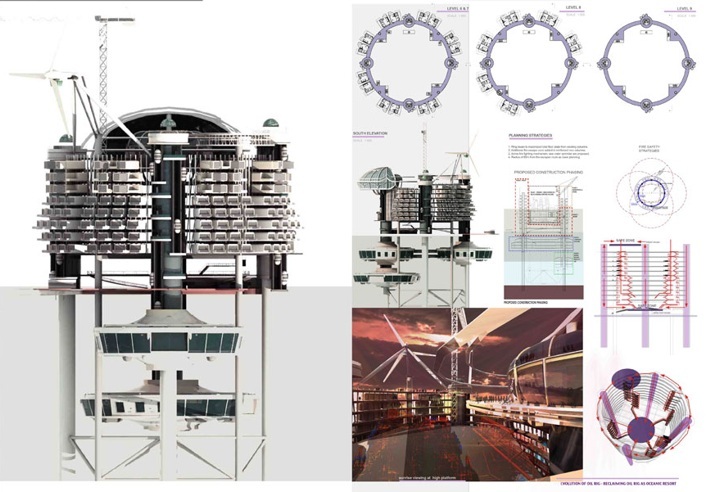 Designers Ku Yee Kee and Hor Sue-Wern are also exploring the potential of off sea oil rigs. 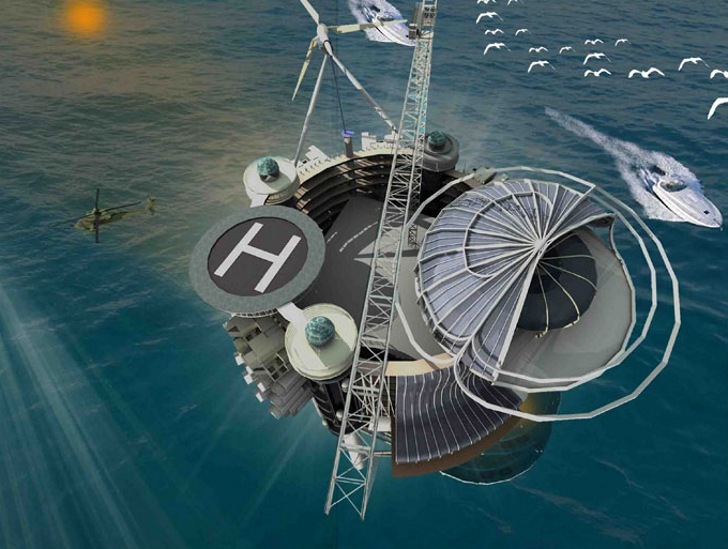 They’re envisioning ways to completely refit old, abandoned oil rigs to transform them into bustling living centers that can permanently host inhabitants. Their design features staggered layers of outward jutting living units, all surrounding a central recreational and community center. This layout is an extremely efficient use of space, which is crucial for such a small community. With sustainability features, such as wind turbines and tidal energy generators, oil rig communities such as these could remain fairly sustainable and successfully support potentially hundreds of people. Don’t think that these oil rigs are the next suburb, however, because oil rig communities will only really be suited for a specific type of person. 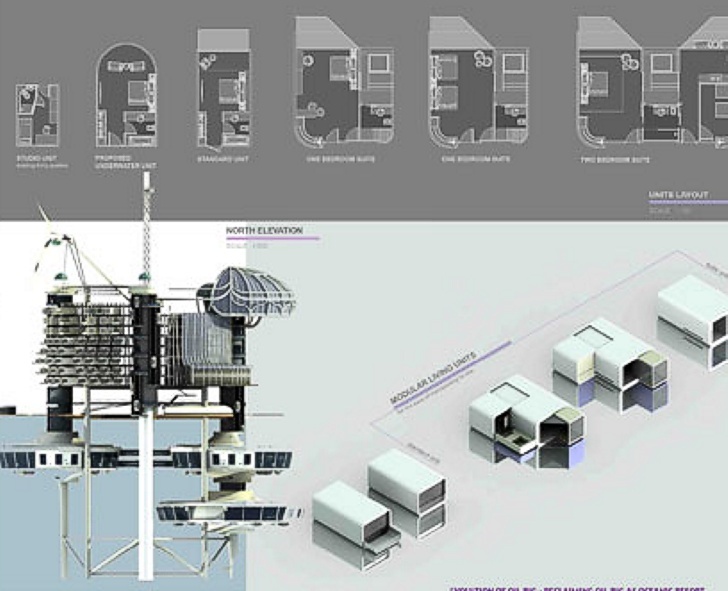 Compared to several other floating community designs, urbanized oil rigs have several disadvantages. First off, a smaller space would mean that there is less area devoted to labor and work, meaning that only a select group of individuals would be able to make a living there. Unless you’re a reclusive author, marine biologist, or eccentric inventor who does his best work in solitude, you’re probably better off avoiding oil rig habitats. Additionally, people who live in these oil rigs would need to be comfortable with (and, indeed, actually enjoy) being separated from the bulk of mainland. Larger floating cities, such as Noah’s Arc, contain such an enormous number of people that inhabitants see new faces all the time. If you’re stuck on a manmade island with 100 or so people, then you’d better be sure that you really like those people, or you’re bound to go stir crazy. Transforming old oil rigs into communities is an interesting idea, but it will realistically lack a few features that will be necessary for normal living. If the oil rigs were close to bustling cities, then communities like these might actually be possible. After all, riding to work on a boat is a great way to beat rush hour, and you’d constantly have a great view of the ocean. If the oil rig is more than 30 miles from a major city, though, that’s when things start to get tricky. In cases like that, you’re not creating an aquatic community so much as a prison. At that point, it starts to look like the setting for some weird, seaborne murder mystery.